The Regal Eagles robotics team is set for a challenge at the For Inspiration Recognition of Science and Technology Robotics Competition World Championship, to be held in Detroit, Mich. from April 24-26. This marks the third straight year that the Regal Eagles are contenders in this event. Bethpage High School senior, Soham Maiti recently had a philosophy article published in the magazine, Questions: Philosophy for Young People. The magazine is unique because it publishes the work of K-12 students interested in philosophical issues. Soham felt that his experiences taking philosophy class with Ms. Way, serving as President of the Philosophy Club, and Captain of the Ethics Bowl Team gave him a great foundation to analyze how ancient philosophy affects the modern world. His article, "The Allegory of the Digital Cave" explores whether the pursuit of truth sill matters in our society. The district congratulations to Soham on this excellent accomplishment! For any students enrolled in an Advanced Placement course, AP Examinations will take place between Monday, May 6, 2019 and Friday, May 17, 2019. Please refer to the schedule available at the link below. Bethpage High School Research students competed in the 2018-19 LISEF and JV LISEF fair. Congratulations to Soham Maiti for placing 4th at LISEF in his category! He was also the recipient of the Mu Alpha Theta Award for the most challenging, thorough, and creative investigation of a problem involving mathematics. Special thanks to Mr. Pollatos for his continued guidance and support of the Research students! The district celebrated Pi Day on Thursday, March 14, 2019 with contests at Bethpage High School. Students were tasked with reciting as many correct numbers in a row as possible in the numerical value of Pi. Freshman Gulam Abbas was the individual winner at the high school with 130 digits in a row! In an additional contest, students embraced the challenge of going around in a circle naming one digit at a time. Junior Geanna Koulouris was the final contestant standing to earn a t-shirt along with Gulam. Of course, everyone enjoyed eating apple and blueberry pie! Congratulations all of the participating students for helping to celebrate Pi with this fun contest. The Bethpage Eagles Varsity Hockey Team would like to thank the community for all of their support for the Stick It Cancer Benefit for Cohen's Children's Hospital. In addition to the $21,016 donation made in January, the team will be attending the Team Up for Community Awards Dinner in May where they will receive their 1st Place award of $3,000 from the foundation to add to their fundraising effort. The team would also like to specially mention alumni, Brian Schmier for lending his videography talents to this cause. On Tuesday, March 5, 2019, Mrs. Calio and Mrs. Sagarese were honored by Bernardo Paradiso, the President of IACE for their tireless promotion of the Italian language over the past years. IACE is an organization founded in 1975 for the purposes of promoting the study of the Italian language and culture within the tri-state area of New York, New Jersey, and Connecticut. IACE is made possible primarily through an Italian government grant and operates under the supervision of Consulate General of Italy in New York. The district congratulates both Mrs. Calio and Mrs. Sagarese on this great recognition! On Wednesday, February 13, 2019, the Italian Club students from Bethpage High School decided to test their cooking skills at A La Carte Cooking School in Lynbrook. Students were divided into small groups, each working as a team to create a different course. Dishes included bruschetta, polenta with broccoli rabe, gnocchi pomodoro, chicken piccata, and tiramisu for dessert. Once finished, everyone was able to enjoy a delicious dinner they prepared together! On Tuesday, March 5, 2019, the Bethpage High School French classes, along with Madame Ciarniello, celebrated Mardi Gras (Fat Tuesday) in the beautifully decorated Bethpage High School Auxiliary Gymnasium. We enjoyed a variety of ethnic foods, some typical Mardi Gras foods (jambalaya and beignets), as well as some French foods (ratatouille, Brie cheese, Madeleine cookies, and of course freshly-made crepes with Nutella and fruit)! Special thanks to our crepe-maker, Monsieur Tony Ciarniello, and a special welcome to our littlest guest -- Austin, Madame's grandson! Everything was "tres delicieux" and "un jour fantastique!" On Monday, March 4, 2019, Ms. Sinisi and Mrs. Marino attended a day of music education advocacy on behalf of NYSSMA. Both Ms. Sinisi and Mrs. Marino sat in on meetings with some of Nassau County's state senators and assembly members. At the conclusion of the day, there was a reception for all teachers, administrators, and politicians featuring live music from the All County Jazz Band, featuring Bethpage High School senior, AJ Vita! AJ also got to meet Senator James Gaughran. The 10th Annual Long Island High School Ethics Bowl took place at Hofstra University in February 2019. An Ethics Bowl is a collaborative yet competitive event, in which two teams are presented with a series of wide-ranging ethical dilemmas and are asked to analyze them and students are judged on the basis of their analyses. Twenty-six teams from fourteen different Long Island high schools matched wits over ethical cases whose topics included allocation of liver donations, bringing extinct species back to life, gerrymandering, and buying followers on social media. The Bethpage team of Andrew Sciglibaglio, Nichole Licata, Soham Maiti, Jessica O'Keefe, and Samantha Salerno took 2nd place while the team of Nichole Zacchia, Ujala Dar, Erica Marciance, and Eirini Drosos took 3rd place! This qualifies both teams for the Prindle Institute National High School Ethics Bowl in June, which will take place in Indianapolis! Congratulations to all of the students that participated! Bethpage Dance Team Repeat at Nationals! The team was also nominated for a Sportsmanship Award by the competition staff members! Congratulations to the Bethpage Kickline Team for their amazing and memorable season! Best wishes to team seniors: Captain Grace Carney; Captain Giavanna Novelli; and Team Officer Madeline Schmidt. The team will miss them greatly next year and wishes them well in their future endeavors! The Bethpage High School varsity kickline team was crowned the National Dance Alliance High School National Champion for the second straight year in the small varsity kick division. The team, which competed in Orlando, Florida on Feb. 24, earned the title of NDA National Champion in kick while finishing 11th in team performance, 12th in the jazz category and second in the pom division. The group also earned awards for innovative choreography in pom and technical excellence in kick, and was recognized with the sportsmanship award for members’ positive attitudes and support of other teams. Upon returning to the high school on Feb. 25, the team was greeted by district and building administrators as well as an excited group of family and friends. “This is a remarkable accomplishment for a second straight year and we are very proud of these Golden Eagles,” said Superintendent of Schools David Schneider. On Sunday, February 17, 2019, the Bethpage High School Robotics Team, Regal Eagles, FIRST Robotics Competition Team #2869, hosted their second annual Week 0 Event. A Week 0 Event allows teams from across our region to come together for calibration and practice matches in order to get a sense of how each team's robot will perform during upcoming regionals, but before teach team's mandatory "stop build" deadline on Tuesday, February 19, 2019 at 11:59 PM EST. The Regal Eagles hosted ten other robotics teams from the region in their event in the Bethpage High School Gymnasium that featured a robotics field built to the same dimensions as what each team will face during their regional competition challenge called "Deep Space". Special thanks to the Regal Eagles, team advisors, Dr. Kay and Mr. LaSpina, the army of parents/guardians for their donations of food, beverages, basket raffle items, assistance with construction and field setup/breakdown and time, the custodial engineers, facilities/maintenance staff, technicians, and volunteers. Also, the district thanks FIRST Long Island (also known as the School Business Partnerships of Long Island) for their continued support of the Regal Eagles and all robotics teams and programs across Long Island and Mackenzie Pech, Bethpage Schools alumnus and former Regal Eagles captain, who served as game announcer throughout the day! The Regal Eagles will participate in their first regional event at the School Business Partnerships of Long Island Regional at Hofstra University on March 26, 2019 and March 27, 2019. They will also participate at the New York City Regional on April 5, 2019, April 6, 2019, and April 7, 2019 at the Armory. Freshmen students in Ms. Papetti's Period 1 and Period 9 Living Environment classes applied their knowledge of the mitosis stages to a hands-on activity with Play Doh. They worked in groups of four to illustrate the entire process of mitosis. Six of our Bethpage High School Science Research students participated at the Long Island Science and Engineering Fair (LISEF) on Wednesday, February 6, 2019 and did an exemplary job! Congratulations to Soham Maiti for advancing to Round 2 of LISEF on March 14, 2019. The Bethpage High School Varsity Kickline team completed at the Nassau Scholastic Championship on Sunday, February 3, 2019. After a long day of four performances, the team walked away ranked 4th in Jazz; 2nd in Kick; 2nd in Pom; and 2nd in Team Performance. The team was also named "Champion of Champions" in the Team Performance category. This title is given to the team that competes at all local competitions and has the highest cumulative score in that dance category (combining scores from all size divisions). Special recognition to the Varsity Kickline team Seniors: Captain Grace Carney, Captain Giavanna Novelli; and Team Officer Madeline Schmidt. Each of these girls has made a huge impact on the team these past few years and they had beautiful performances at their final local competition! Best wishes to the team for their upcoming trip to Orlando, Florida to attend Dance Nationals! The Bethpage High School Varsity Kickline program competed at the NDA Regionals this past weekend at Walt Whitman High School. After a long day, the team finished 5th in Jazz; 2nd in Pom; 2nd in Team Performance; and Regional Champions in the Small Varsity Kick category. They also took home the Specialty Award-Technical Excellence in Kick! The team is excited about the season and cannot wait to see what the future will hold! In December, the Bethpage High School French Club had a fundraiser, raising $250 for the children of Haiti, specifically for the Mission Grandbois. Grandbois is a small rural town in Haiti that has no electricity or running water. The people of Grandbois are very poor. On January 3, 2019, Madame Margarett Alexandre, who was born in the town of Grandbois and is a registered nurse in the United States with a doctorate in nursing visited the French Club during their meeting. She gave a wonderful presentation on her work in Haiti. She also presented the club with certificates, thanking them for their generous efforts. The Bethpage Varsity Kickline, Golden Girls and Company, competed at the second Nassau Scholastic competition of the season on Sunday, January 6, 2019. The team placed in all four of their competitive dances, ending the day 3rd in the jazz category, 2nd in both pom and kick, and 1st in their team performance category! It was an exciting day and the team has so much to be proud of! On Friday, December 7, 2018, the Italian students from Bethpage High School spent a beautiful day enjoying the sights and sounds of Manhattan during the holiday season! After indulging in some delicious pastries and espresso from Ferrara Bakery in Little Italy, the students feasted on delectable Italian cuisine at Carmine's Restaurant. The trip concluded with a stroll through Midtown to see the renowned Rockefeller Christmas Tree along with other famous sites such as Bryant Park, St. Patrick's Cathedral, and the spectacular holiday window displays along Fifth Avenue! The Bethpage High School Art Club made Holiday cards for a local nursing home. Special thanks to Ms. Stagliano and the Art Club for their special thoughts and sentiments. Happy Holidays! It was far from a normal night of hockey at the Town of Oyster Bay Ice Skating Rink in Bethpage, as four local teams came together for a “Stick it to Cancer” fundraiser to raise money for Cohen Children’s Medical Center on Dec. 19. The first game featured Port Washington/Great Neck/Herricks vs. Farmingdale, while the nightcap included Bethpage hosting Oceanside. Hockey was surely the backstory in what was an emotional evening for those in attendance. The fundraiser touched close to home, as Bethpage High School junior and hockey player Derek Zacchino has been battling a brain tumor since being diagnosed in September. While Zacchino was hoping to be well enough to participate in the puck drop at the beginning of the game, he got better news than he could imagine, as he was cleared to play in the game the morning of Dec. 19. Prior to the game, guest speakers included Town of Oyster Bay Supervisor Joseph Saladino and Superintendent of Schools David Schneider. Syosset Hockey presented Zacchino with a signed jersey by former New York Islander Pat LaFontaine. Zacchino’s girlfriend and fellow Bethpage High School student Bridget Pfeifer performed the national anthem. "Thank you to everyone who is here to support such a wonderful cause," Schneider said. "I couldn't be prouder of our staff members who planned and organized this fantastic event and our entire community who eagerly participated in order to raise money and awareness for the great work [Cohen Children's Medical Center] does for our children." Outside the rink, volunteers sold T-shirts, sweatshirts, cupcakes and raffle tickets to collect money for the cause. All in all, the event raised more than $16,000 to be donated to Cohen Children’s Medical Center. To cap things off, Schneider announced that the Bethpage Hockey Team won first place in the Team Up 4 Community Service Challenge for the hockey game initiative, which drew a monstrous ovation from the crowd. On the ice, Bethpage prevailed against Oceanside with a 4-3 victory. On Friday, December 21, 2018, the Bethpage High School Faculty & Staff donned their best "festive sweaters" to raise funds for the Cycle for Survival charity. Through their collection, over $1,000 was raised to support this charity. Thank you to everyone who participated and donated to this cause. 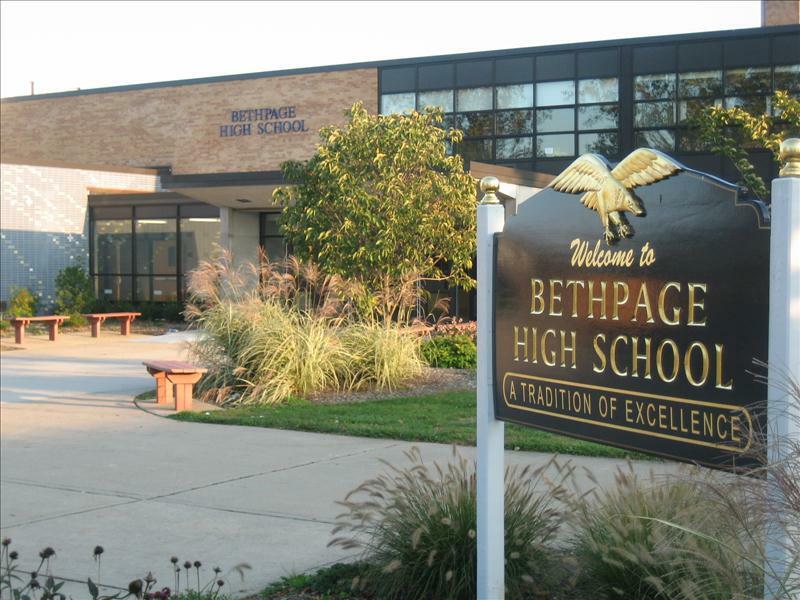 Happy Holidays from the Bethpage High School Faculty & Staff! On Saturday, December 15, 2018, members of the Bethpage High School Chorus and Chorale sang holiday carols at the Town of Oyster Bay Ice Skating Center. Junior Bridget Pfeifer also performed a beautiful rendition of the National Anthem! On Dec. 11, eight Bethpage High School seniors declared their commitments for the fall of 2019 by signing National Letter of Intent to continue athletic careers at the collegiate level. Joined by Superintendent of School David Schneider, Director of Athletics John Franchi and Principal Nicholas Jantz as well as their coaches, parents and siblings, the seniors made their future paths in college athletics official. “We are super proud of our student-athletes as these eight seniors sign their National Letter of Intent to continue athletic careers in college,” said Mr. Schneider. The Bethpage Hockey Team participated in the 2018 Long Island Holiday Sports Hero Video Challenge. Please click on the link below to support their fundraiser, Stick It to Cancer. You can vote ONE TIME EVERY DAY through Tuesday, December 18, 2018. The Bethpage Hockey Team can be awarded funds to support their cause (Cohen's Children's Research Hospital). The Benefit Hockey Game, Oceanside vs. Bethpage, will be held on Wednesday, December 19, 2018 at 7:30 PM at the Town of Oyster Bay Bethpage Rink. A raffle auction will be held at the game. UPDATE (12/19/18): The Bethpage Hockey Team learned prior to their Benefit Hockey Game that their Stick It to Cancer video received the MOST votes in the 2018 Long Island Holiday Sports Hero Video Challenge! As a result, the team will be awarded an additional $3,000 to support their cause (Cohen's Children's Research Hospital). On Sunday, December 9, 2018, the Varsity Golden Girls and Company Kickline competed in their first local competition at Nassau Community College. The team danced in four categories (jazz, team performance, pom, and kick) and placed with each routine! The team ended the day in 3rd for jazz; 2nd for kick; and 1st for both team performance and pom! Congratulations to the Varsity Golden Girls and Company and a special congratulations to team seniors: Gracie Carney, Giavanna Novelli, and Madeline Schmidt! Junior Alexander Dupree has turned his love for animals into a potential career at the beginning of this school year. He enrolled in the BOCES Veterinarian Science program at Barry Tech, where he was recently named Student of the Quarter. Alexander earned this honor as an acknowledgement of being the top student in the class in terms of participation, grades and excellence. The Veterinarian Science program’s curriculum is dedicated to building upon the connections between animal health and well-being as well as environmental and ecosystem health. Students such as Alexander have been able to get a head start on a possible and exciting career path. The district congratulates Alexander on being named Student of the Quarter at BOCES and look forward to future milestones. The Board of Education meeting on Nov. 27 was a time to recognize and honor the exceptional accomplishments being achieved by students from Bethpage High School. The Board and entire district salute these exceptional students and wish them continued success! The Bethpage High School Masquers’ Guild put on several riveting performances of “Clue: On Stage” at the Bethpage Center for Performing Arts from Nov. 15-17. Audiences comprised of administrators, students and community members attended and applauded the first show of the year. Directed by Ms. Ilana Strongin, the guild debuted the play during a dress rehearsal for JFK Middle School students and select community members on Nov. 14. Official opening night for the public was held on Nov. 15, and was followed by two more performances over the next two days. The play is based on the cult classic film and the popular board game. With the theater taking the setting of a dark and stormy night, the show played to a madcap comedy that kept the audience guessing until the final twist. The district congratulates the entire cast and crew for their outstanding performances. The entire community looks forward to the guild’s next performance of “Bye Bye Birdie” in March! The Bethpage High School French Club had "un voyage fantastique en ville de New York" on Wednesday, November 14, 2018. Their first stop was "Gulliver's Gate," an exhibition of famous cities from all around the world all in miniature model size! The attention to detail was amazing! Students loved seeing La Tour Eiffel, L'Arc de Triomphe, the Louvre, and the Champs Elysees! Their second stop was the French restaurant, Cafe Un, Deux, Trois, where the students enjoyed many French foods, such as chicken cordon bleu, steak-frites, crepes, and escargot. Don't forget the delicious desserts including creme brulee, sorbet, and mousse au chocolat! Absolument delicieux! Special thanks to Madame Ciarniello for organizing this experience! Bethpage High School Masquers' Guild Presents "Clue: On Stage"
Come see the Bethpage High School Masquers' Guild perform the High School edition of "Clue: On Stage"! You may be familiar with the movie or board game version of the classic story. Tickets are $8.00 each. The show runs three nights: Thursday, November 15, 2018; Friday, November 16, 2018; Saturday, November 17, 2018; at 7:00 PM at the Bethpage Center for the Performing Arts (at Bethpage High School). Tickets are available for purchase at the door or from Mrs. Marino ahead of time. If you have any questions, please reach out to Ms. Strongin (ihuertastrongin@bethpage.ws) or Mrs. Marino (mmarino@bethpage.ws). Congratulations to Valenni Passaro, Adina Rahman, and Erica Marciante whose essays took 2nd, 3rd, and 4th place in the National Kids Philosophy Slam Essay Competition. Plato would be extremely proud! The Kids Philosophy Slam was created by John Davis to provide a powerful opportunity to help students grapple with life's big issues. Each year, a different question is chosen that requires students to think about a major philosophical idea that is relevant in their lives and society. This year's essay topic was "truth or deceit, which has a greater impact on society"? The winning essays can be found at the link below. Any Bethpage High School student who is interested in entering the 2019 Kids Philosophy Slam Essay Competition should see Ms. Way for details. On Monday, November 5, 2018, the Bethpage High School Varsity Cheerleaders hosted the 3rd Annual Little Lady-Special Person Dance. The dance was held in the Bethpage High School Gymnasium and was a huge hit this year with close to 400 guests in attendance! Little ladies from Grades K-6 attended the dance with their special guests, including mothers, fathers, grandparents, aunts, uncles, and more! They enjoyed a night of music, dancing, pizza, and snacks! Thanks to everyone who came out to support the cheerleaders! Students in Ms. Pepetti's Living Environment classes at Bethpage High School performed some hands-on learning during their laboratory experiment, "Diffusion Through a Membrane". The students were very excited to pose with their artificial cells! The Bethpage High School French Club took part in Safe Halloween with the theme of Rataouille! The French Club members dressed up as chefs, rats, and servers and played some fun games with the visiting children. It was a busy evening, but a lot of fun! Staff members at Bethpage High School got into the Halloween Spirit! Please enjoy the pictures available in the link below! Happy Halloween! On Thursday, October 11, 2018, the Bethpage High School Jazz Combo, comprised of AJ Vita, Jessica O'Keefe, Soham Maiti, and Andrew Sciglibaglio, performed at the Adults and Children with Learning Disabilities (ACLD) Annual Benefit Dinner at the Garden City Hotel. The students were extremely proud and honored to be able to volunteer their time and talent for an important cause. On Tuesday, October 16, 2018, the Bethpage High School Marching Band, Varsity Kickline, and Junior Varsity Kickline took part in the 56th Annual Newsday Marching Band Festival at Mitchell Field Athletic Complex in Uniondale, New York. The Newsday Band Festival takes place over three nights where marching bands from both Nassau and Suffolk County get to showcase their dedication, hard work, and talent. Special thanks to our chaperones for ensuring that the night ran smoothly, our drum majors, Jessica O'Keefe, John Schmidt, Sophia Suazo, and AJ Vita for leading such a talented group of musicians, and our kickline captains, Gracie Carney and Gia Novelli for helping to put together another dazzling performance! On Thursday, October 11, 2018, students in the Bethpage High School Italian Club spent the afternoon strolling along Arthur Avenue. The club advisors, Mrs. Sagarese and Ms. Calio, guided the students along the historical area known as "Little Italy" of the Bronx. Everyone enjoyed buying fresh mozzarella, hand-made pasta, cannoli filled with delicious cream while you wait, and a variety of authentic Italian items in specialty stores along the strip. Vendors were also impressed to see that our students were up for the challenge of practicing their Italian skills as they searched and paid for their items. The group ended their trip with a wonderful meal at Trattoria Zero Otto Nove, enjoying Italian specialties such as pizza margherita, lasagna, gelato, and tartufo. Squisuto! On Sunday, October 21, 2018, the Varsity and Junior Varsity Kickline teams participated in the Making Strides Against Breast Cancer Walk at Jones Beach. The teams walked with hundreds of others in support of those who have battled and are still battling cancer. In addition, the teams raised $825.00 for the American Cancer Society. Fantastic job to the Bethpage Kickline programs! Students in Mrs. Sciglibaglio's AP Environmental classes performed a field study at the Marine Nature Study in Oceanside, New York. During the trip, they learned about the history and significance of the marsh system to Long Island, studied the marsh food web, tested the water quality, did a transect survey of the marsh plant species, and cast nets to collect and survey the marine species. Students were able to connect their classroom learning in an authentic setting. The Bethpage High School Robotics Team, the Regal Eagles (Team #2869) participated in their first off-season competition of the year at the Hudson Valley Rally on Saturday, September 29, 2018 at the New York University Tandon School of Engineering. The competition was based on the FIRST Power Up game, pitting the Regal Eagles against fifteen other teams. The Regal Eagles were ranked #3 going into the playoff matches and won their semi-finals matches, 2 games to 0. In the finals, the Regal Eagles worked alongside Stuyvesant High School and Townsend Harris High School. After dropping the first match of the best-of-three finals, the three-team alliance successfully completed their comeback, taking both of the remaining matches to prevail in the finals, 2 games to 1! The Regal Eagles successfully defended their championship, having won this off-season competition in 2017-18. Congratulations to the Regal Eagles on the victory and to Coach Zabell and Coach Kay! On Saturday, September 22, 2018, the Bethpage High School French Club held its annual car wash to raise money for their trips. Everyone did a fantastic job and the weather was cooperative! There was even a surprise visit from Madame Ciarniello's "grand-fils" (grandson) and some adorable puppies! Thank you to everyone who came out to support the French Club! Bethpage High School's band students participated in Band Camp in Monticello, New York. The band came together and learned an amazing show that will be showcased during halftime at all of the football games. Special thanks to Mr. Stehlik for planning the weekend's logistics and to our drum majors, Jess O'Keefe, John Schmidt, Sophia Suazo, and AJ Vita for directing an amazing show! Also, thanks to our chaperones, Mr. Wibben, Mrs. Sinisi, Mrs. Marino, Mr. Pollatos, Mr. Sciacca, Mrs. Kallmeyer, Mr. Neuman, Mrs. Agnesini, and Mr. Schmidt for helping to make things run smoothly! Summer Assignments for Advanced Placement, Pre-AP, and Philosophy courses are now available. They can be accessed by selecting "AP Summer Assignments 2018-19" in the left menu or by clicking on the link below.